Did you know you can now order your Just Eat takeaway from WasabiSabi here on View? WasabiSabi delivers traditional Japanese cuisine of the highest quality. 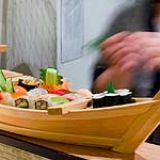 Why not try the Teppanyaki room in which a chef will cook your meal in front of you on a hot plate or just grab a quick snack from the Sushi bar. Do you work at WasabiSabi? What did you think of WasabiSabi? Not bad little bit over priced but the food tastes very fresh and appears to be quite healthy. Superb food superb atmosphere Pricey? yes a bit but quality costs. Nick I totally agree with your reviewGreat place to eat, infact I went 4 times in 2007, due to me spreading the word. Friends decided to have their birthday celebrations there.Were taking the kids this Christmas as a treat, as they no longer have Christmas parties at school.Feel sure they'll absolutely love it !! !Denise, South Yorkshire. A great restaurant, serving excellent quality food/ingredients, prepared with great style and finesse. The surroundings are very relaxed, and in no way pretentious. We sat in the main restaurant, and enjoyed starters, shared luxury platter, dessert and drinks for less than £60 - which we felt, for what we'd had, was good value, and an enjoyable experience. (Would highly recommend the shallow fried Pork and Vegetable Dumplings as a starter). Maybe next time we'd try the tepanyaki(? ), as it sure sounded fun, with applause and cheering coming from that area of the restaurant. (We even had to 'sneak a peek' on the way out). All in all, a great retaurant, that if/when we were back in Sheffield, we would have no hesitation in heading straight for again - and we've already been spreading the word amongst our friends. WasabiSabi was established in 2004 and is based on traditional Japanese food, prepared to a high standard in a stylish atmosphere. 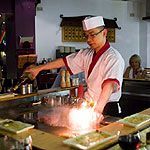 It’s quintessentially Japanese and visitors to Sheffield from the Far East often stop by for a taste of home, joining the local diners for some sushi, noodles or teppanyaki. London Road is home to more than 30 restaurants and kebab houses representing the diverse ethnic mix of the area. WasabiSabi sits among Turkish, Chinese, Indian, Polish and quintessentially British chippies like A Salt & Battered. If you're walking there you run the risk of being lured into another restaurant. The restaurant has three distinctly different dining areas. Firstly there's a standard seated one where diners order a la carte, the second is a sushi bar for those in a hurry and the third is teppanyaki tables where diners sit around a large square table to be entertained by the incredible skill of their individual chef who cooks the food in front of everyone on a huge hot plate. The teppanyaki area has a jovial feel. Strangers are forced to sit together and bond through the shared novel experience of seeing their food prepared in front of them. Dextrous chefs frequently and expertly throw bits of fried egg directly into the mouths of the diners, all adding to the fun. The formal, ordered approach of the staff and large number of Japanese diners creates a very genuine experience. The menu is different for the seated restaurant bit and the teppanyaki area. The restaurant area provides more straightforward meals while the teppanyaki diners can choose a set menu and then eat each of the many courses as they are cooked in front of them. Typically the courses in the teppanyaki meal are meat or fish dishes served with a hot sauce or some rice. The chefs' skills are not limited to a graceful cooking performance as they also possess expert memories as they need to remember everyone's orders. Favourites include the scallops which are cooked to perfection with a crispy and nicely browned edges and a beautifully soft middle. The style of eating up to seven smaller dishes rather one or two large ones is much more sociable and gives you the opportunity to truly enjoy the food. The perfect accompaniment for the sometimes hot flavours in the horseradish based sauces is a Japanese beer, but many drinks both from the Far East and the rest of the world are available. This is not a cheap night out, but the quality of the food and service justifies the expense. The only draw back is that some chefs are slightly less entertaining than others and because watching the cooking is part of the experience this can be a little disappointing. This is minor when compared to the excellent food and service found in all three areas of the restaurant.